Have you ever questioned how much social media can play an impact on policy and procedure? Or how many hidden “secrets” are now coming to light through various media? One of the wonderful things about twitter…and Facebook…and LinkedIn is the incredible opportunity for networking. I mean, seriously, short of a conference how often do we get 100s of SLPs (or more) all together (and actually encouraged to talk!)? One of the disconcerting things about twitter…and Facebook…and LinkedIn (well, okay..not so much LinkedIn just yet)… is when I see SLPs who love what they do get beaten down by apparently senseless rules. Now, don’t get me wrong…I love rules. There are reasons for rules and I’m not a total anarchist…Really… I’m not… But rules should have a purpose. Rules for rules sake are wrong. Heck, almost anything for anything’s sake is wrong…(except chocolate of course..everything is better with chocolate). Recent conversations on twitter (and Facebook) have sparked a lot of discussion on rules for different SLPs in different states (and countries). We’ve talked about caseloads (and you all know how I feel about that!). We’ve also talked about functional communication and how teaching labeling vs requesting is really idiotic…but that’s another soapbox. Trust me, it deserves its own rant. The latest twitter conversation has to do with progress reports. In some states it appears the powers-that-be have created paperwork just for paperwork’s sake. I’m fairly certain that if there was a study done, we’d find these rules are created to 1) make sure we’ve done our part to employ someone to read these things, 2) because the powers-that-be are really paid by the paper supply company, 3) someone has the misguided concept that the benefit of speech-language therapy is directed related to the amount of paper consumed by an individual, or 4) they didn’t realize that SLP stands for Speech-Language Pathologist and not Speech-Language and Paperwork. Now, before anyone says anything…please know, I am not talking about my school district or my special education unit. I will be the first to say, my unit is completely reasonable and has worked hard to make sure all of their employees (SPED and SLP alike) feel valued. 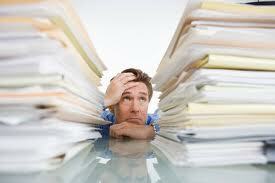 Our paperwork load is big…but it is manageable; and, after talking with the SLPeeps on twitter, more than reasonable. One SLP mentioned some insurance companies require progress reports to be sent in every 4 weeks. These progress reports must demonstrate … progress. Another SLP mentioned that she is now required to send in progress reports to her school district every three weeks. Three weeks? Now…I will say, I’ve been told I’m fairly good at my job…I’d like to think I’m very good at my job…but seriously? How much progress can there be to measure in 3-6 sessions? Seriously… Unless we are miracle workers, the majority of our kids are not going to show dramatic improvement in that little time. Frankly, I think our time would be better spent actually doing the therapy and showing bigger gains less often than the microscopic gains that occur in three weeks. Heck, in a Cycles approach – three weeks isn’t even enough to get through an entire cycle so there would be absolutely NO progress to report. Hearing all of this via twitter made me wonder. Is there a reason for all of this paperwork? I sort of understand it if it’s for insurance, although in all honesty, I think that’s bogus and just a reason for insurances to refuse payment…but I don’t understand the school districts. At the most, school districts should require it every nine weeks the same as report cards. In nine weeks, I can say there’d probably be measurable progress for most kids…that totally makes sense. Heck, even the RTI experts say we should try an intervention for 6-8 weeks to see if it works…since we’re doing therapy and not an intervention should it be any less? Now…don’t get me wrong. I’m all for accountability. I believe that we should be using evidence based practice and I absolutely believe that if a therapy technique is not working we should change it. To that end, we must take data often…However, there are skills we need to teach before we can take that data. I think a lot of people (SLPs and SPED alike) forget that if these kids had the skills already they’d be using them. We should not be taking data and trying to use it to show progress when we are teaching the student the skill set. If I have to give the student maximum cues for every single word – he doesn’t have that skill. He’s not making measurable progress. The measurable progress comes when I don’t have to give him maximum cues. When he’s able to use some of the skills on his own given just a few cues. Then I reduce the number of cues or prompts and keep measuring. That’s progress and worth reporting. If a middle school students requires me to sit by him and help him with every single sentence in a written paragraph – he doesn’t have the skills for me to show progress. He needs to learn the skills first…then show progress when he’s applying them. See what I mean? It makes sense doesn’t it? Ideology aside, let’s look at numbers. I know when I write progress reports it’s time-consuming. For my caseload of under 50, it can take upwards to 5 hours to write the reports themselves (and I don’t have many students with major problems). I usually do it over a few days so it doesn’t get overwhelming and my last report is as detailed as my first report. For people with caseloads in the 60s…or 80s…or 100s…it would take much longer. Not only do they have more kids, but in higher populated areas, the chances of having kids with severe problems is greater. A progress report for a child with a sound-system delay is not the same as a progress report for a child who is lower-functioning and severely autistic. I’d imagine the progress reports for the clinicians probably take … oh, let’s say 8 hours. That’s a full work day. Now, there are 36 weeks in an average school year. If we divide that by 3 (after all, we need to do progress reports every 3 weeks)… then that’s 12 full days that is devoted only to progress reports. That’s not including the reports necessary for assessments, re-evaluations, and revised IEPs…That’s just progress reports. Unfortunately, of course, the SLPs that have this many students can’t do the paperwork at school…they’re seeing students. So the paperwork goes home. That 12 days (by the way that’s 96 hours) of paperwork writing is 12 days that is 1) unpaid (because they are doing it at home on their own time, and 2) time away from their family. Of course, the SLP wants desperately to keep her job so she doesn’t say anything…or she says things but is ignored or labeled “troublemaker.” Resentment builds…Burnout ensues…and the SLP starts looking for another job (which only compounds the problem because the school districts who do this aren’t going to hire anyone else, so another SLP has to pick up the slack!). Why does this have to be the way it happens? When will the people who make the rules see that SLPs are not magicians…we are not saints…we are not Anne Sullivan (heck, even Anne Sullivan worked for months before seeing any real “progress”). Progress doesn’t happen all at once…it’s (wait for it) … progressive. If making rules for rule’s sake is wrong…requiring paperwork for paperwork’s sake is wrong too. What can we do, collectively as SLPs, to end this unmanageable practice? For many years, I didn’t understand why so many SLPs were against school positions. I’m beginning to see why now. Unreasonable caseloads lead to unmanageable workloads. When the powers-that-be refuse to listen and make the necessary changes, SLPs are forced out. But, in the long run, it’s not the school district who pays the ultimate price for unfair practices…it’s the SLPs and the kids they see. How often do your school districts, insurance companies, etc. require progress reports? What is the rationale for having to provide them that often? How long does it take you to write them? Do you write them at home or at work during your work day? Drop me a line and let me know. The reason (we are told) that we must send every 4.5 weeks is because SPED has to be reported on as frequently as Gen Ed. SO, because students get progress reports from their teachers, we must send progress on their IEP goals. Ours doesn’t have to be lengthy or specific…there are really no guidelines about what goes in the IEP progress report. Typically we do something general for the progress report (Satisfactory progress at this time, Not turning in homework, etc. ), then when report cards go out (9 weeks), we give actual data progress. If I plan well enough, I am able to get them done at school…I try to do a some each day. That way is really manageable. But if its a really busy week then I do them at home. That’s great to know Jenn. Thank you. That sort of makes sense…In my progress reports, I’m required to provide exact levels – beginning levels and ending levels. So for instance, if a student is 40% accurate at the beginning of the reporting period and increased to 70% accurate, those numbers have to be reported. It sounds like that is not what is required in your mid-term reports, correct? Several years ago we were required to do midterm and quarterly reports, but that is no longer a requirement. 1. Respond to order for eval and tx (for every pt admitted to facility) (Paper) ~ For screen only, approximately 15 minutes per pt, for eval ~ 5 minutes to write and file. I try to lump as many as I can together to save time walking to file and discussing with nursing/dietary or logging on the the EMR system (which takes a few minutes). I also keep order sheets and dietary orders handy in my clip board and try to write them while I’m working with the pt that day. in Victoria, Australia, we (school-based SLPs) are not mandated to send in progress reports unless the kiddo is using a government fund to subsidize his/her speech tx sessions. kids who get seen in schools funded by the department of ed generally do not get progress reports done unless the school/parent requests. so it really varies. i’ve had parents tell me that they didn’t even realize their kids were receiving speech tx when they had been in the program for months and some even years! this obviously presents a problem of accountability.